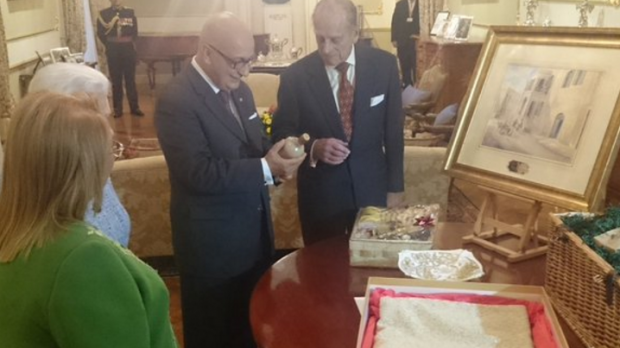 A painting of Villa Guardamangia was among gifts given to Queen Elizabeth by the President this afternoon. The Queen lived at Villa Guardamangia for two years between 1949-1951 when she was a princess. The place, alas, in now in a bad state of repair and the Queen will not be taken to see it. The painting was made by Edwin Galea. Other gifts for the Queen and the Duke of Edinburgh included traditional Gozo food. The Queen presented President Coleiro Preca with a gold lace work, and a Royal Crown Derby fruit bowl.